One of my favourite work ‘tasks’ is reading primary sources – essentially, scouring period newspapers, magazines, diaries and letters for insights and revelations. For no accountable reason my family (Midlands mining/textile background) kept a bound volume of the sensationalist newspaper The Days Doings – Here and There, from 1870-1874. I loved turning the stiff pages as a child and seeing women being savaged by circus lions; men blown sky high in factory explosions; actresses ‘surprised’ in their boudoirs by moustachioed strangers… All very gory or titillating by turns, and yet quite tastefully depicted. We can be less than satisfied with the image accompanying the article. 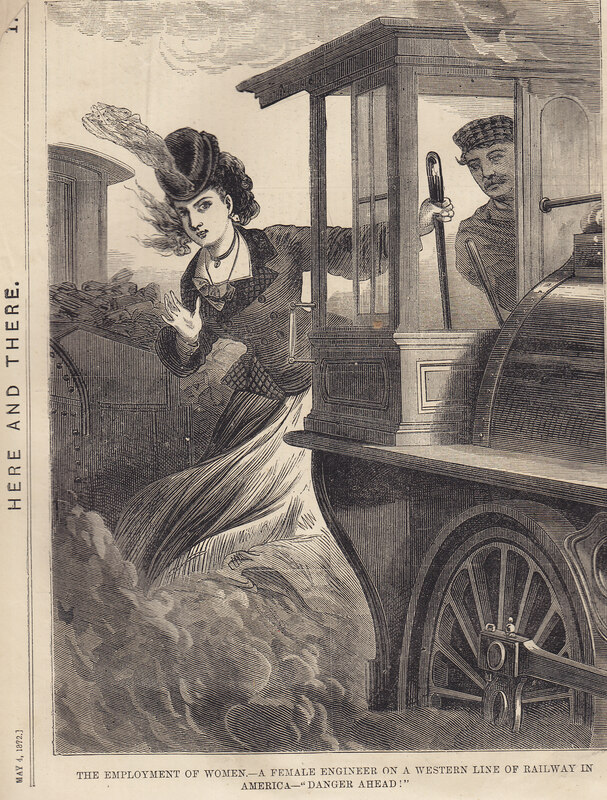 For once the female’s ankles are hidden, but it is extremely unlikely anyone would drive a locomotive in fashionable hat, low-cut bodice and swirling skirts. Now I’m speculating – is there, somewhere in the States – a genuine image of this pioneer railway worker?